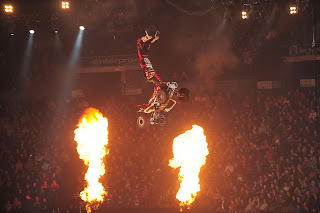 Nuclear Cowboyz is the greatest, high octane-fueled entertainment freestyle motocross touring production on the planet. It is the legend of two powerful freestyle motocross tribes whose survival in their futuristic world is told through an action-packed narrative of fearless freestyle aerial feats, gravity defying stunts, wild acrobatics and pyrotechnics fueled by an energizing soundtrack. The Nuclear Cowboyz tour has the greatest cast of freestyle motocross, trials and quad riders ever assembled taking their power to the massive ramps, alongside the sizzling Nuclear Cowgirlz dancers. Nuclear Cowboyz is a freestyle motocross performance of pure danger and raw energy that catapults the extreme into a heart pounding, unimaginable theatrical explosion. A must see in 2013! Disclaimers Not valid on VIP Fall Out Zone or Gold Circle seating. Valid only on $35 seats. Must be purchased in packs of 4. Limit 12 tickets in one purchase. Savings of $60! Congrats to Kendra... but I am a little confused as to how the winner was selected. I did not see her entry on the giveaway post (http://momamongchaos.blogspot.com/2013/01/giveaway-time.html) . I am also curios as to whether or not I enter correctly..so I know for next time. There were 10 from FB & the 3 from the blog. You had 2 entries. The most anyone could get was 2. I listed them with numbers by names. We have 2 more giveaways coming up soon. Watch for one starting on Monday. There was also entries on the Facebook page. I will have Stephanie confirm it, when she gets a chance.